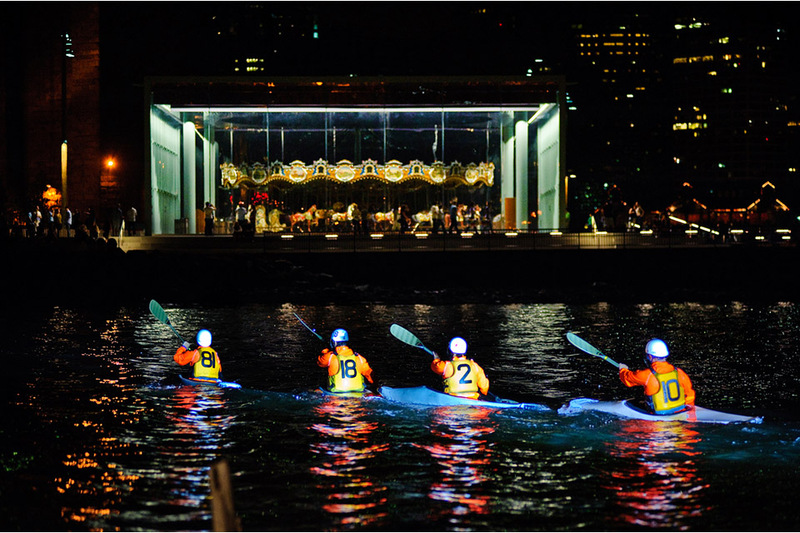 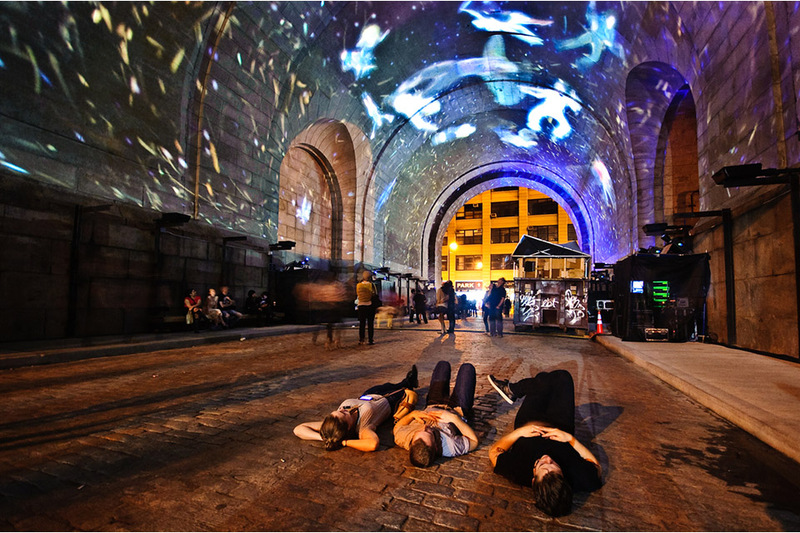 A three-day celebration of the arts, the DUMBO Arts Festival brought spontaneous performance, site-specific sculptural interventions, international video art, and large scale projections to the waterfront neighborhood of DUMBO, Brooklyn for a one-of-a-kind art happening. 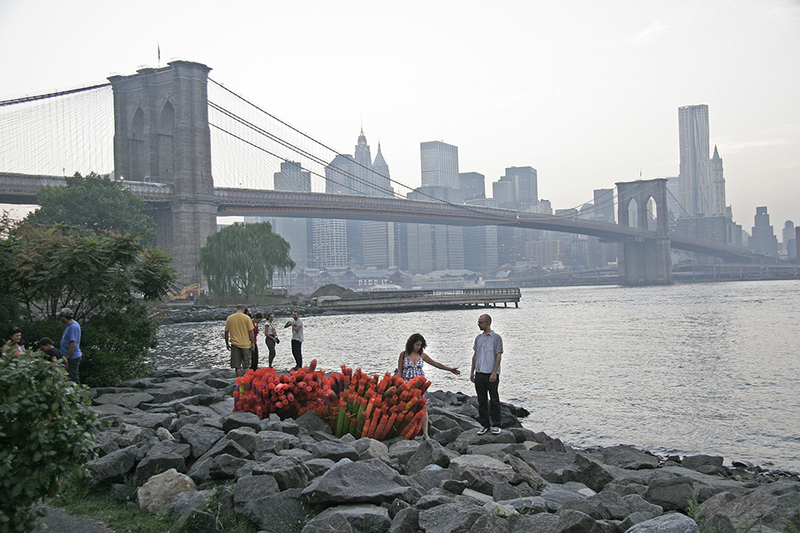 The DUMBO Arts Festival gave emerging artists the unique opportunity to experiment in the public domain, as artists and audience alike explored every corner of DUMBO’s post-industrial landscape. 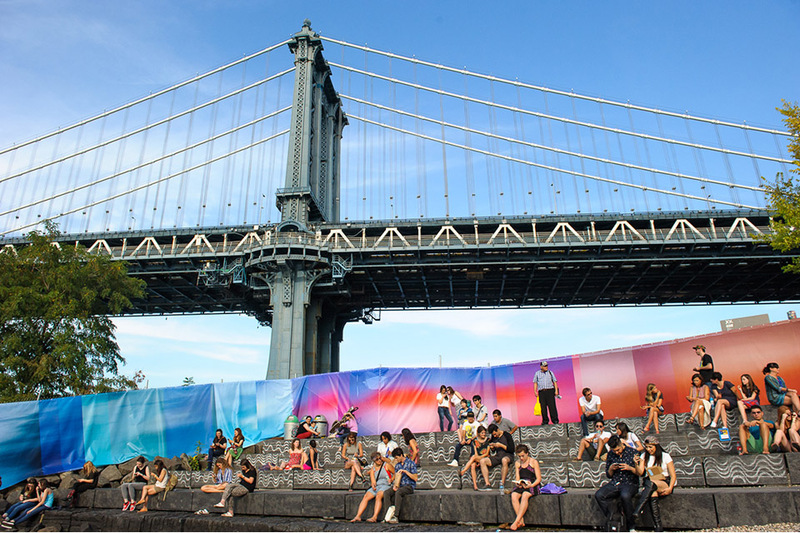 Presented annually from 1997 to 2014, the festival grew from a grassroots effort to bring DUMBO’s artists out of their studios and onto the streets into the nation’s largest urban forum for experimental art, eventually attracting over 200,000 visitors for one vibrant weekend each fall. 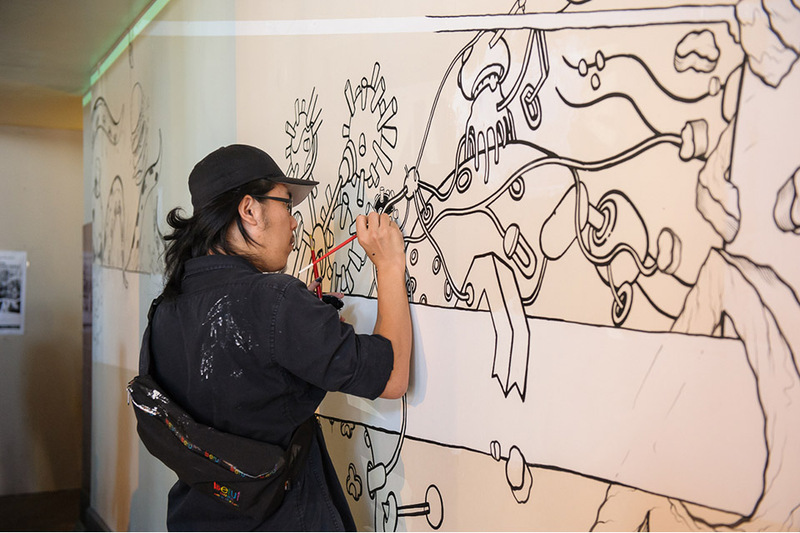 Thousands of artists participated in the festival over the years. 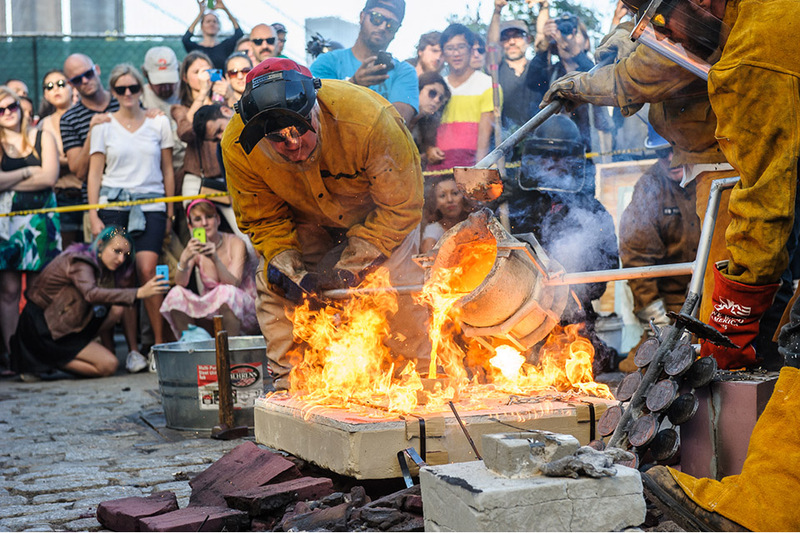 Below is an overview with highlights from the past eighteen years. 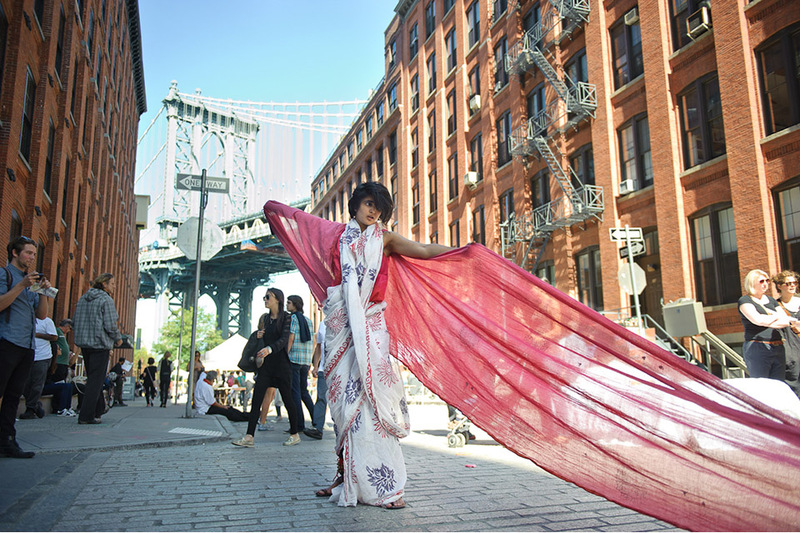 The DUMBO Arts Festival was a multi-site celebration of the arts, bringing innovative and challenging artwork to a diverse audience and providing a career-making platform for artists from around the world. 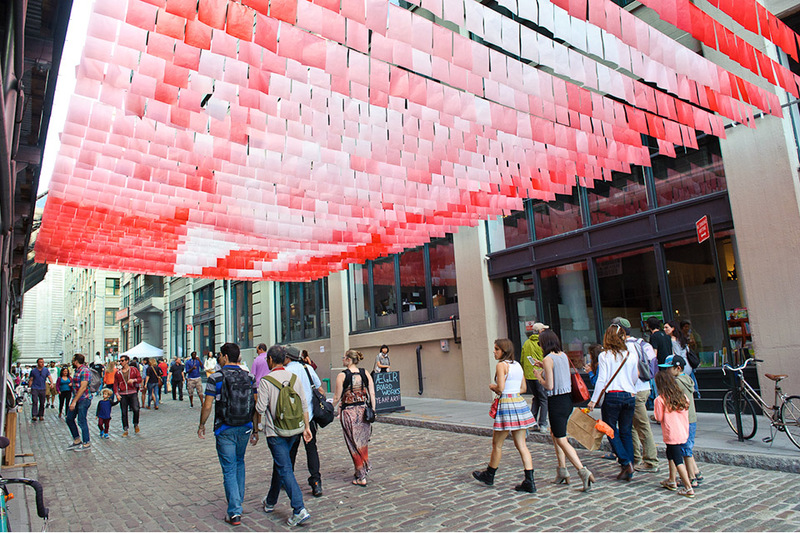 Founded in 1997, the DUMBO Arts Festival was the single largest free art event in New York City until its closure following the 2014 festival. 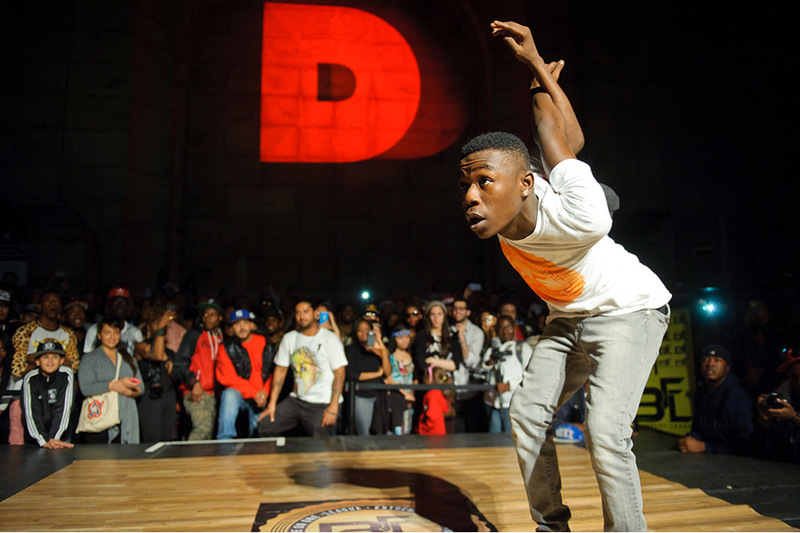 First known as the D.U.M.B.O. 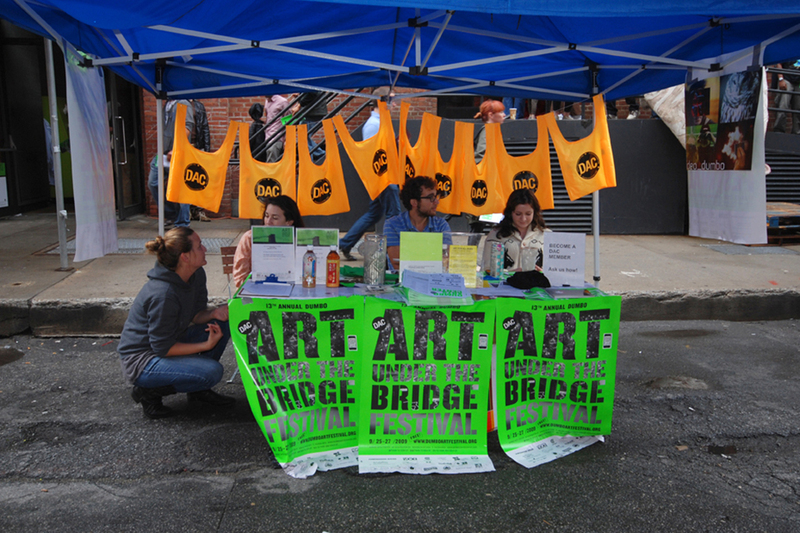 Art Under the Bridge Festival, the three-day happening was initially established as a grassroots artists’ initiative to showcase the neighborhood as a springboard for new art and ideas. 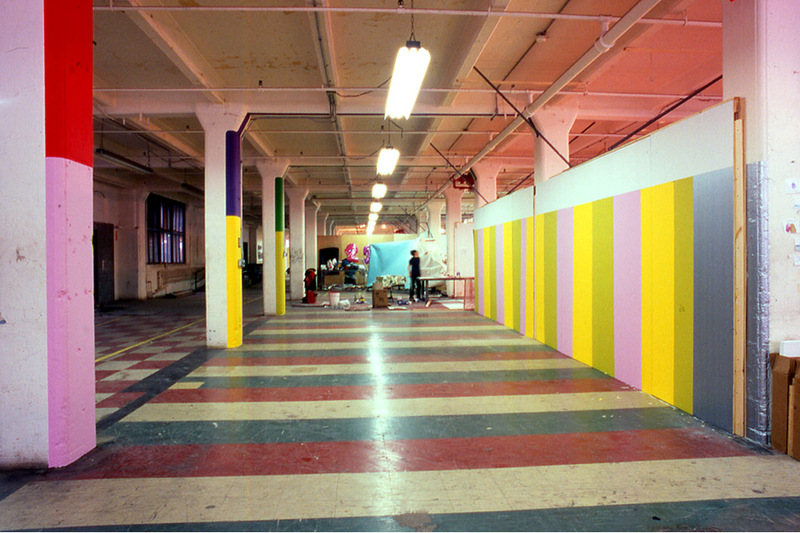 Taking advantage of the unique urban landscape and high density of artist studios, the first D.U.M.B.O. 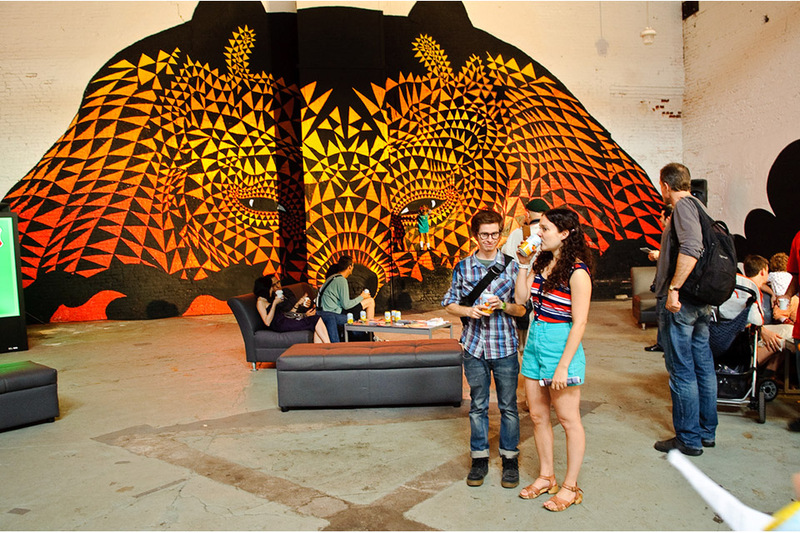 Art Under the Bridge Festival included open studios, live painting, live music, fashion shows, dance performances, and film screenings. 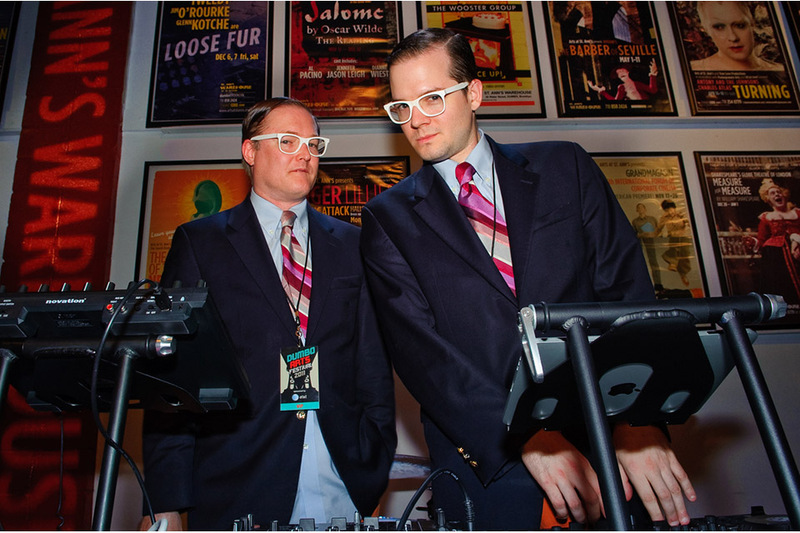 The organizers of the inaugural D.U.M.B.O. 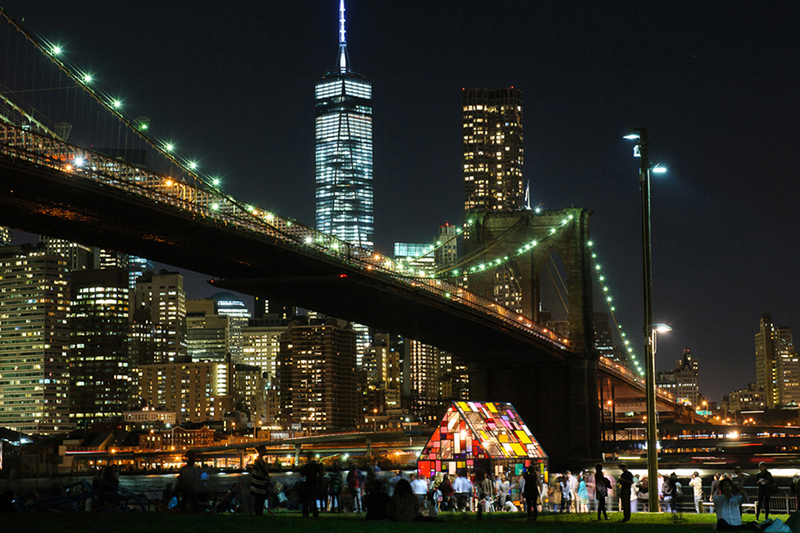 Art Under the Bridge Festival—DUMBO residents Joy Glidden and Tyson Daugherty—went on to found the DUMBO Arts Center, the first non-profit arts organization in DUMBO and steward of the festival from 1998 through 2009. 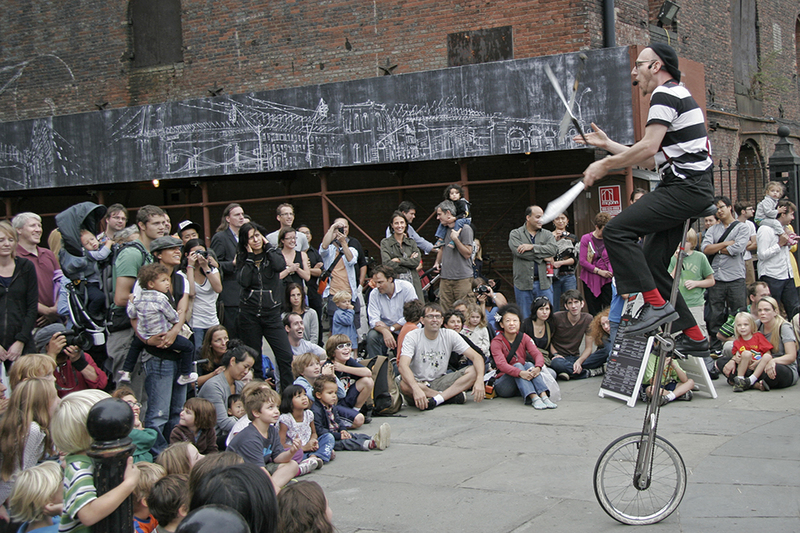 With the DUMBO Arts Center’s announcement of the end of the festival in 2009, festival sponsor Two Trees Management Company stepped in and took over lead sponsorship and organization of the festival. 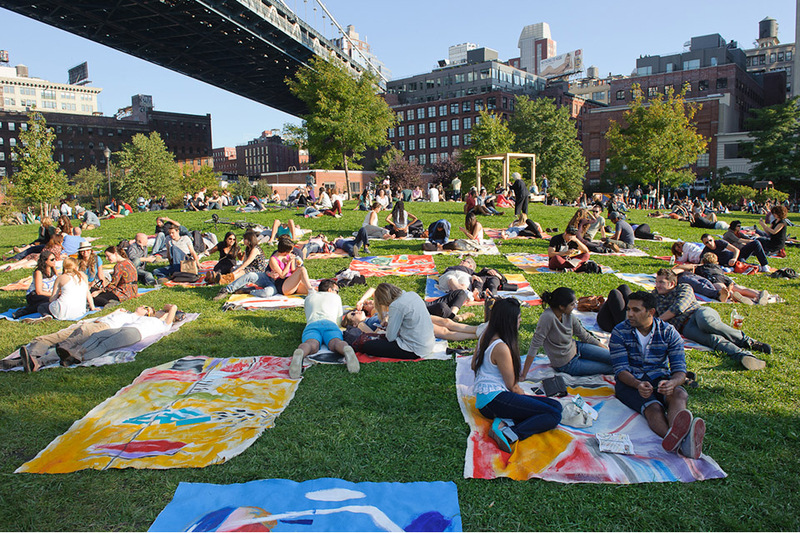 In the following years, festival attendance grew to over 200,000 annually. 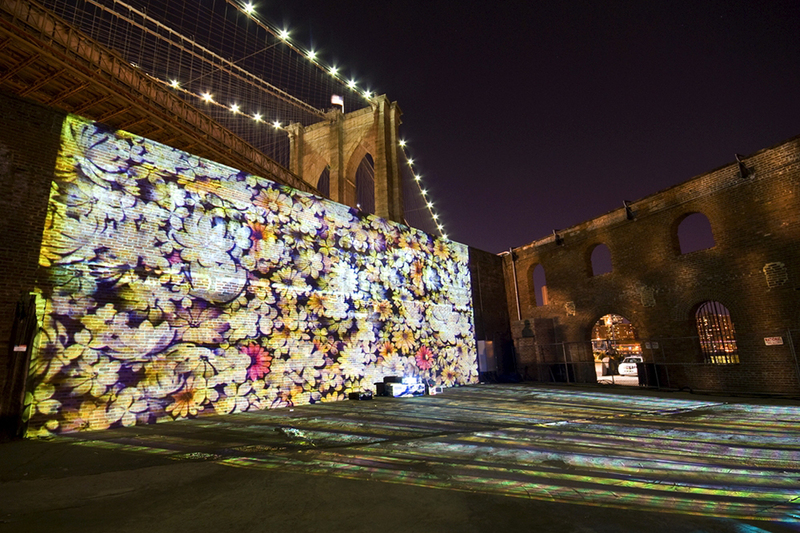 As participation and attendance grew, the festival expanded to include monumental scale projections, interactive technology and new media work. 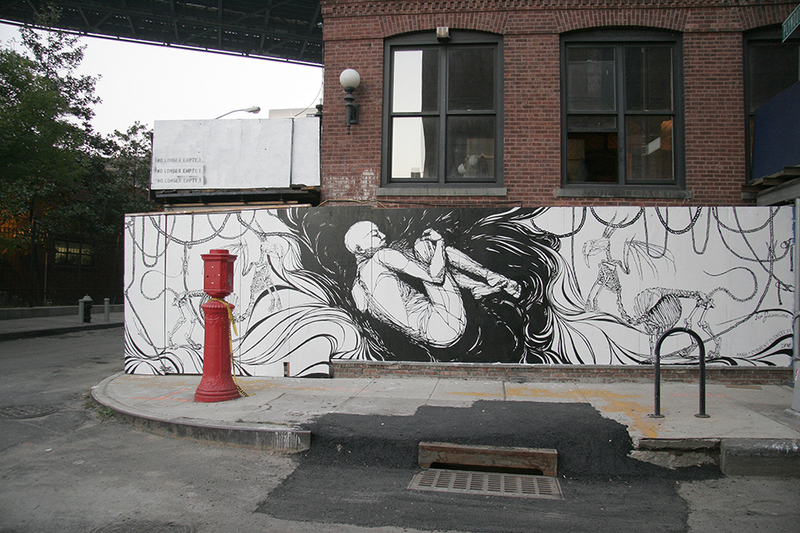 As word of the festival spread, artists from all over the world showed their work in DUMBO. 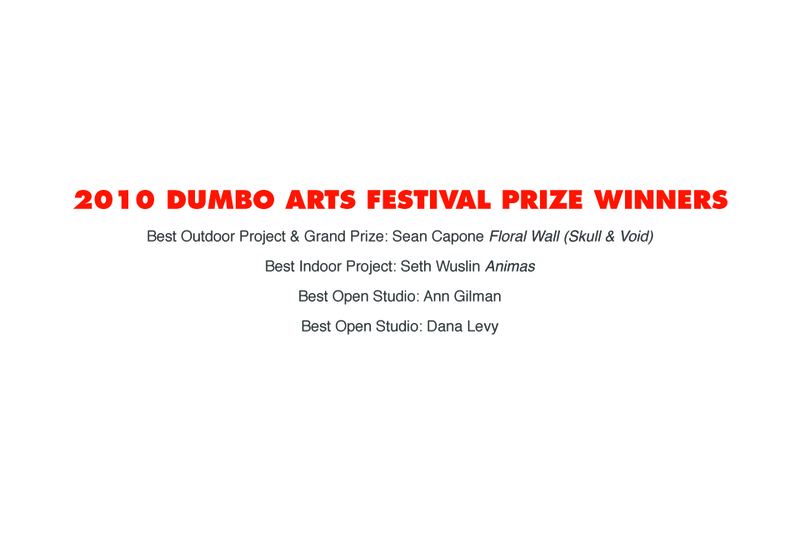 To celebrate the caliber and creativity of its participants, DUMBO Arts Festival rewarded excellence and innovation in the arts by awarding cash prizes for Best Project, Best Exhibition, and Best Open Studio, as well as a Grand Prize of a one-year rent-free studio and an Audience Choice Award. 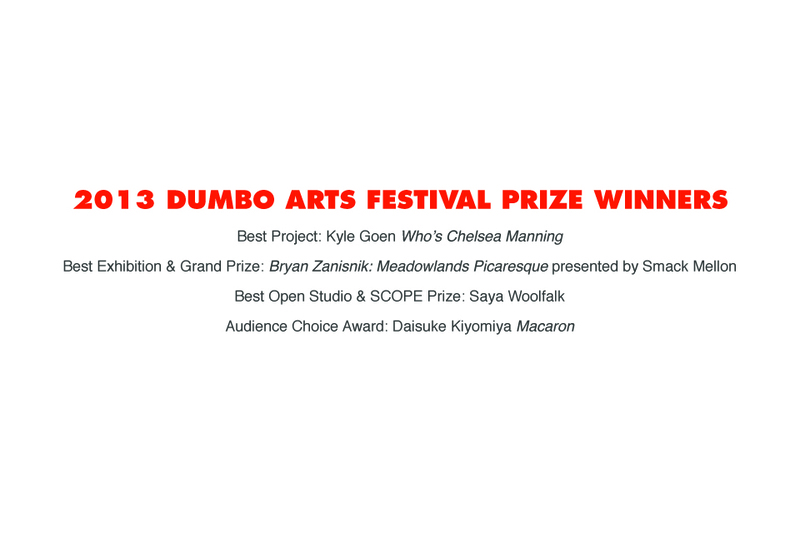 Winners were selected by a jury of art professionals, and the Audience Choice Award winner was selected by festivalgoers. 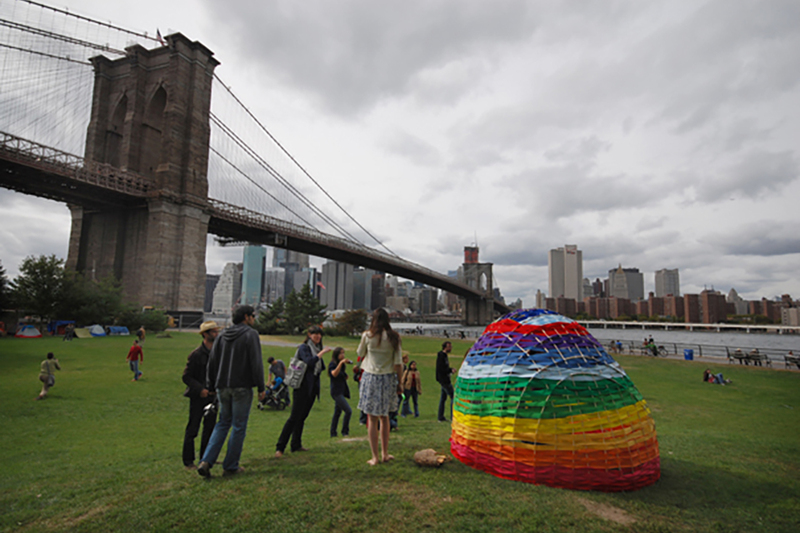 The final DUMBO Arts Festival was held September 27-29, 2014. 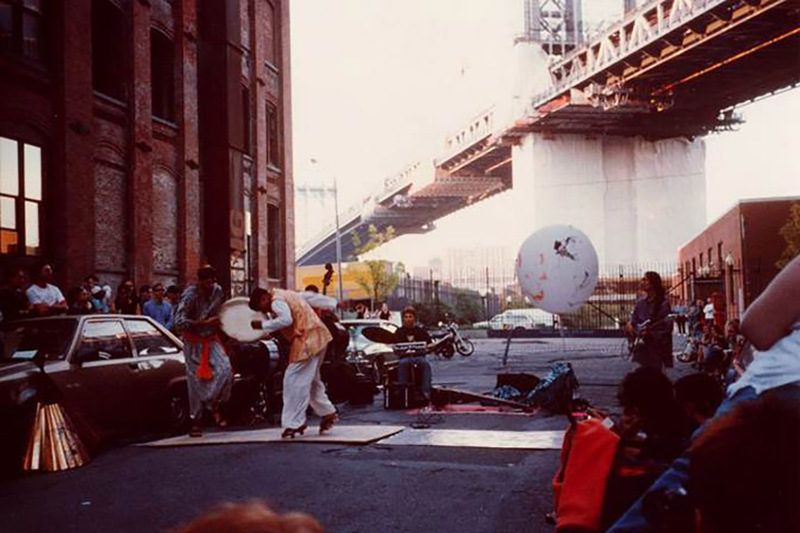 What began as a spontaneous celebration of artists working in their studios developed into a highly anticipated annual event that was instrumental in establishing DUMBO as the strong arts community that it is today. 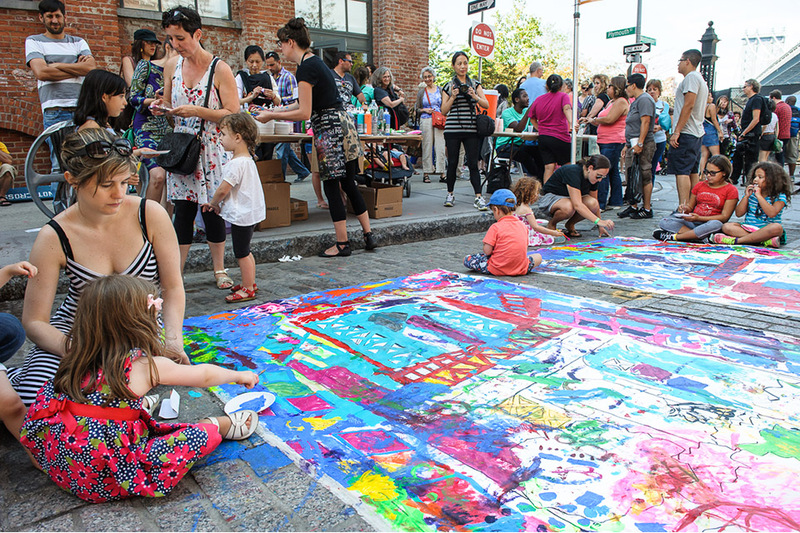 The spirit of the festival lives on with the artists, galleries, and cultural groups that make DUMBO a destination for art year round. 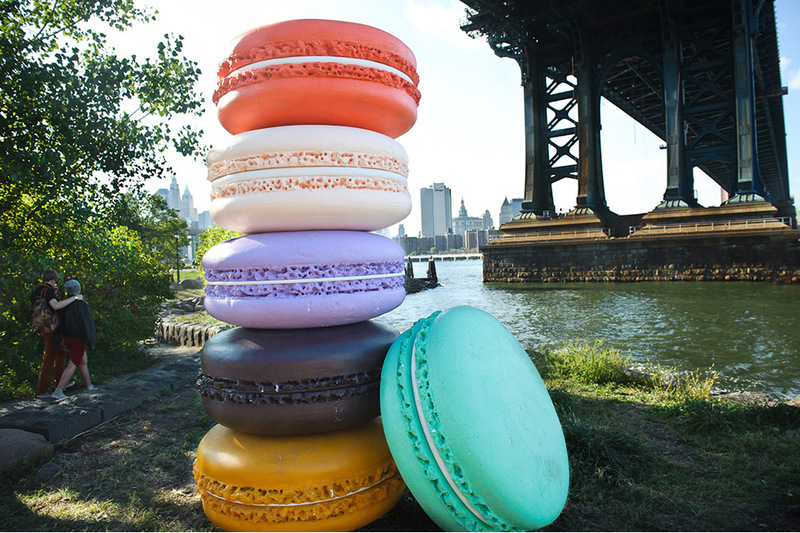 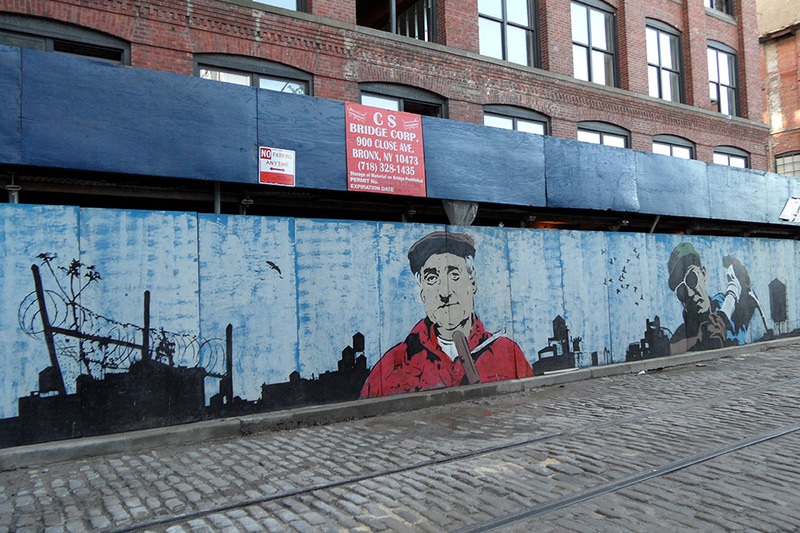 THE DUMBO ARTS FESTIVAL MAY BE OVER, BUT ART IN DUMBO LIVES ON! 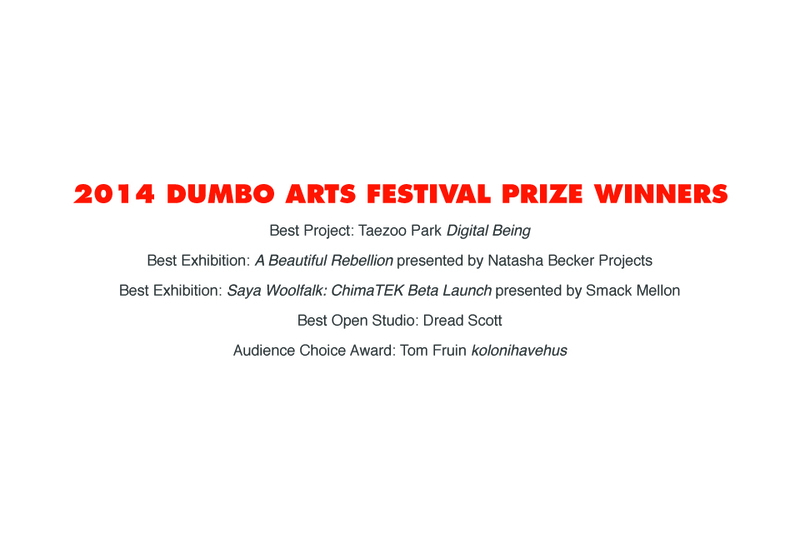 The first D.U.M.B.O. 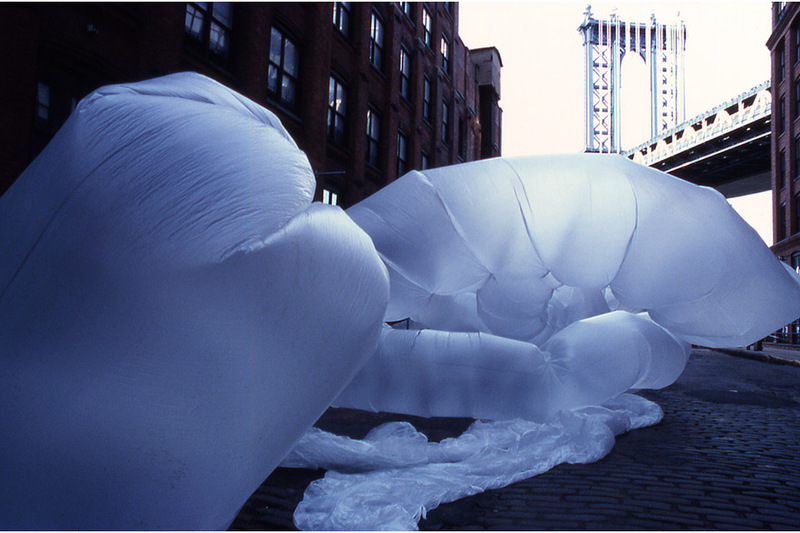 Art Under the Bridge Festival took place in 1997 and quickly became one of New York’s most anticipated art events. 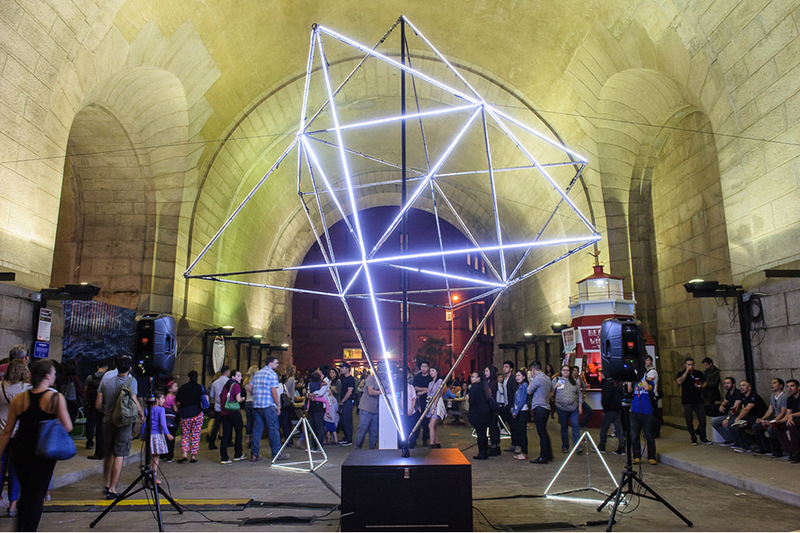 Artists and musicians from all over New York brought work to DUMBO, presenting interactive sculpture, roving performances, video, and music. 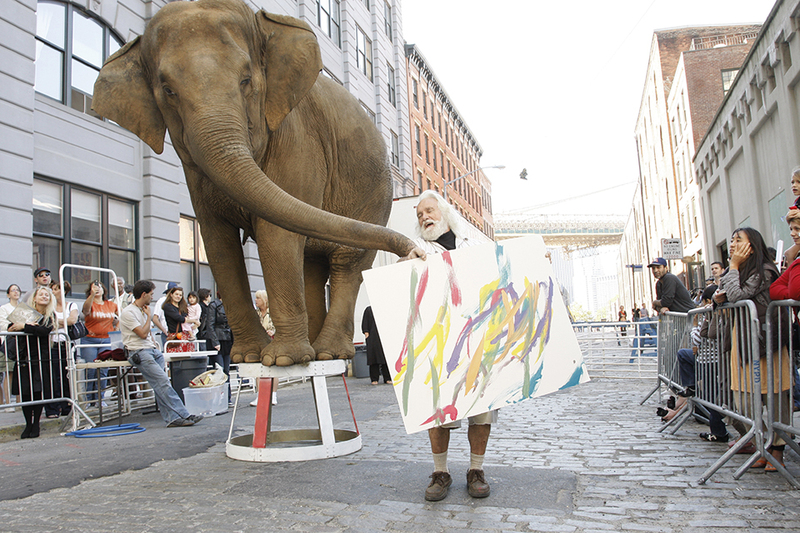 Even Dondi the elephant contributed paintings to the festival. 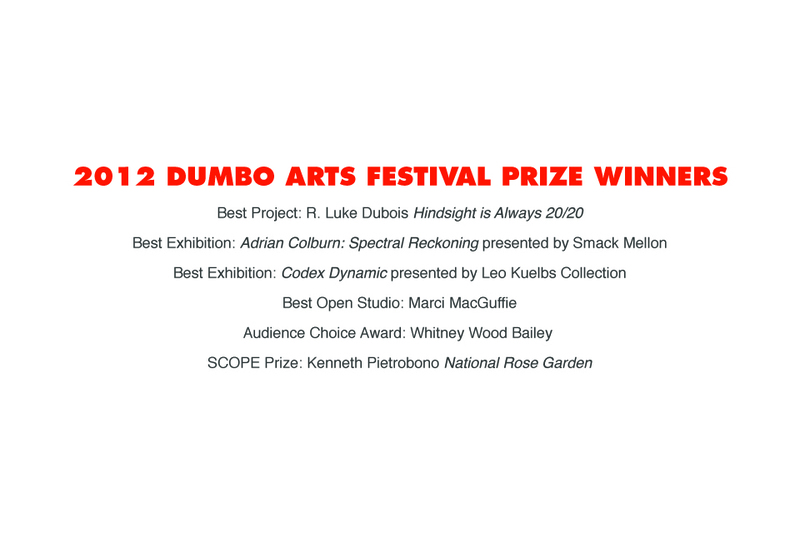 In 2010, the D.U.M.B.O. 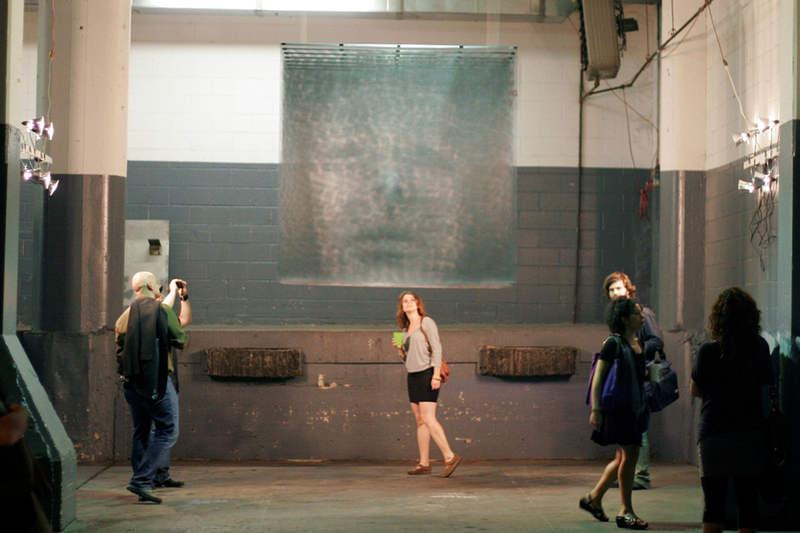 Art Under the Bridge Festival became the DUMBO Arts Festival. 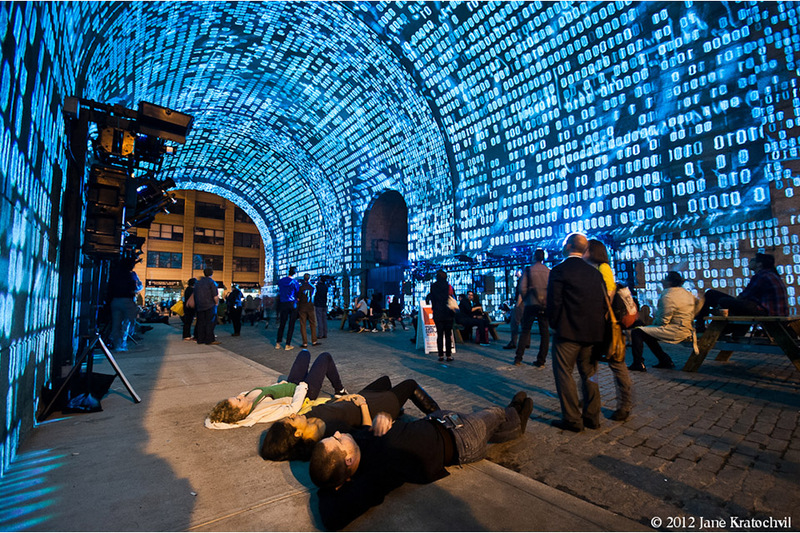 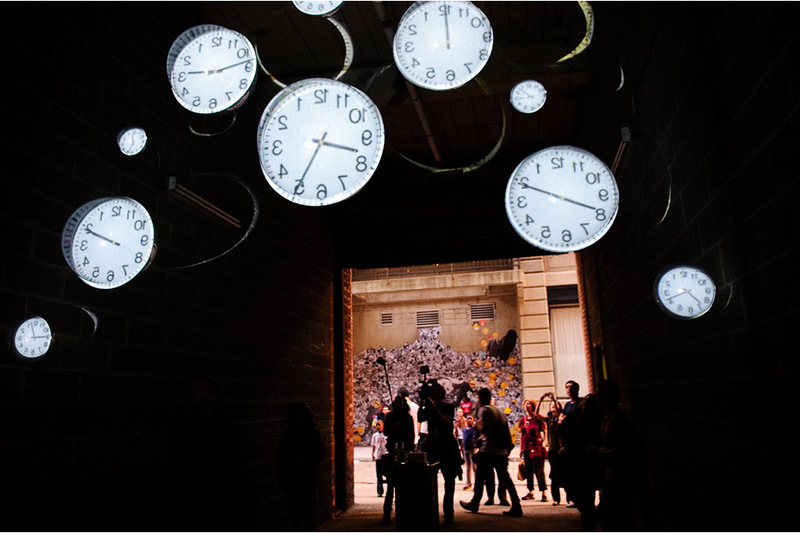 Hundreds of artists opened their studios, brought sculptural interventions and music into the streets, and continued the tradition of projections in the archway, activating DUMBO’s nighttime landscape. 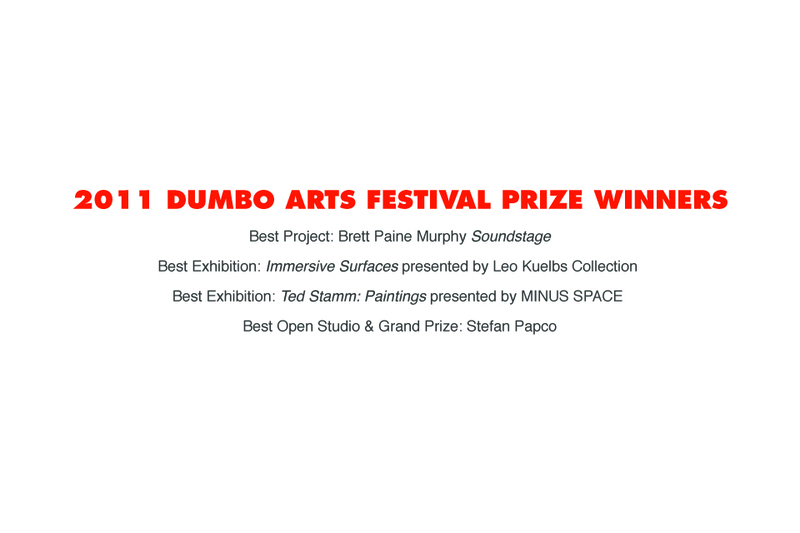 Prizes were introduced to celebrate the work of the artists, with a Grand Prize of a rent-free studio in DUMBO for one year. 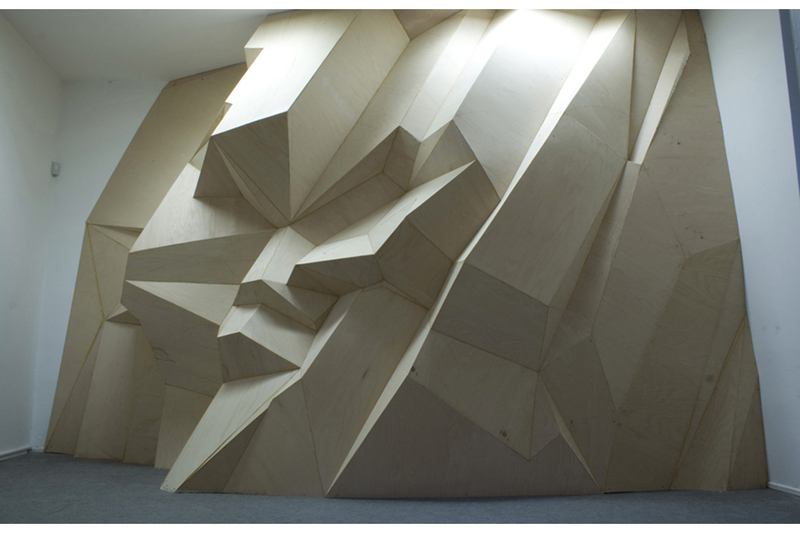 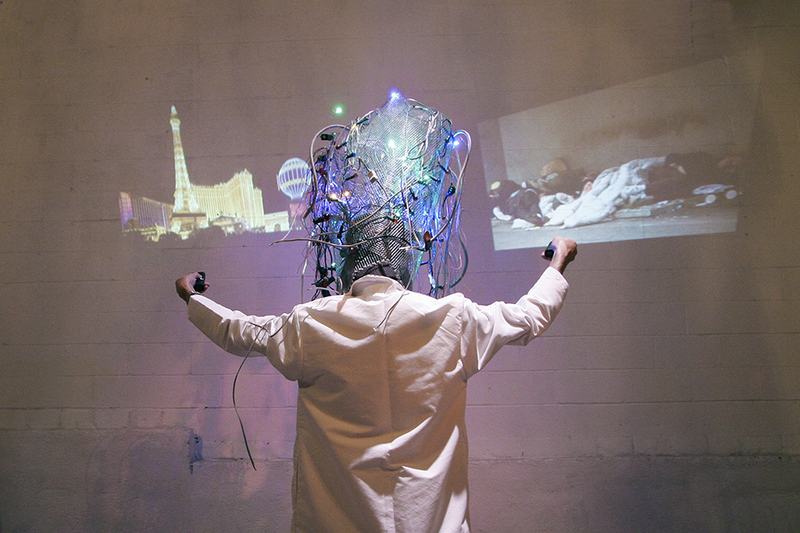 2011 saw the birth of project ideas that would grow to larger art presentations. 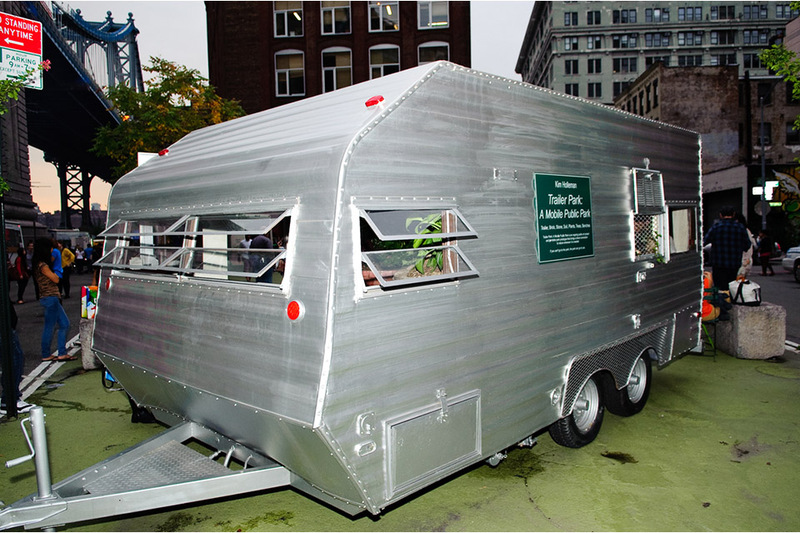 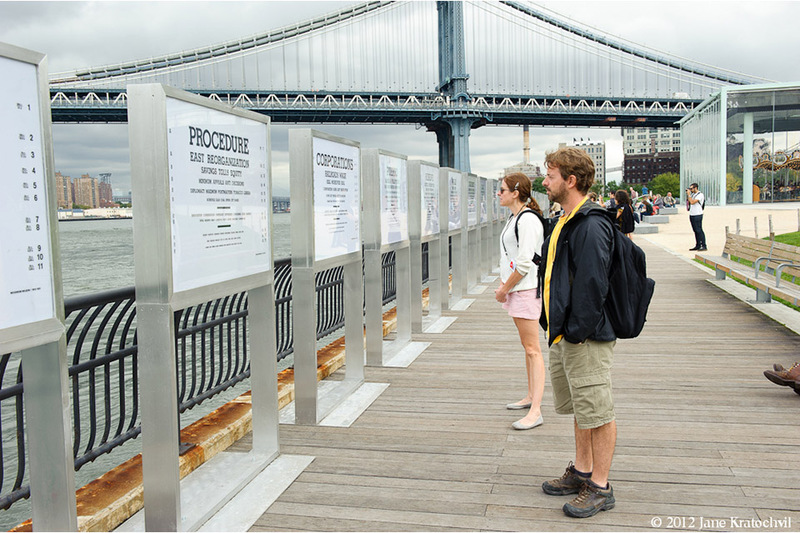 United Photo Industries presented their first foto/pods, which would go on to become NYC’s annual Photoville Festival. 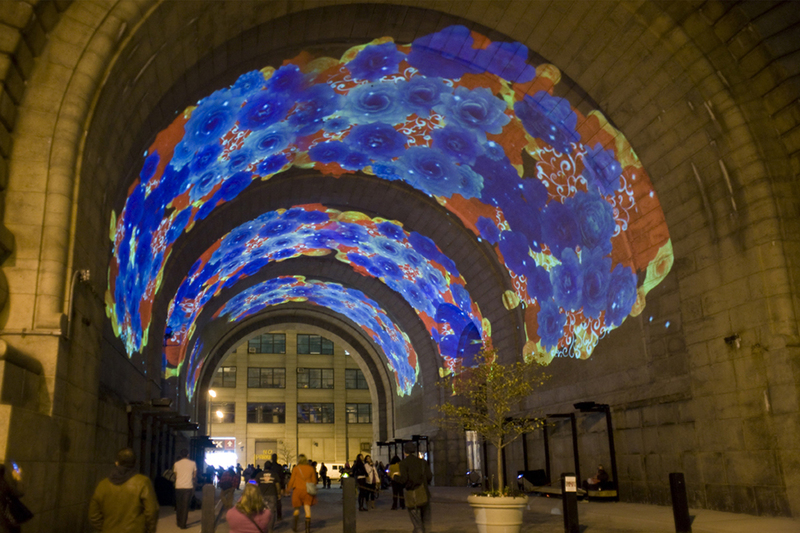 A team of artists created the world’s largest projection mapped video project using the archway and anchorage of the Manhattan Bridge as a unified urban canvas. 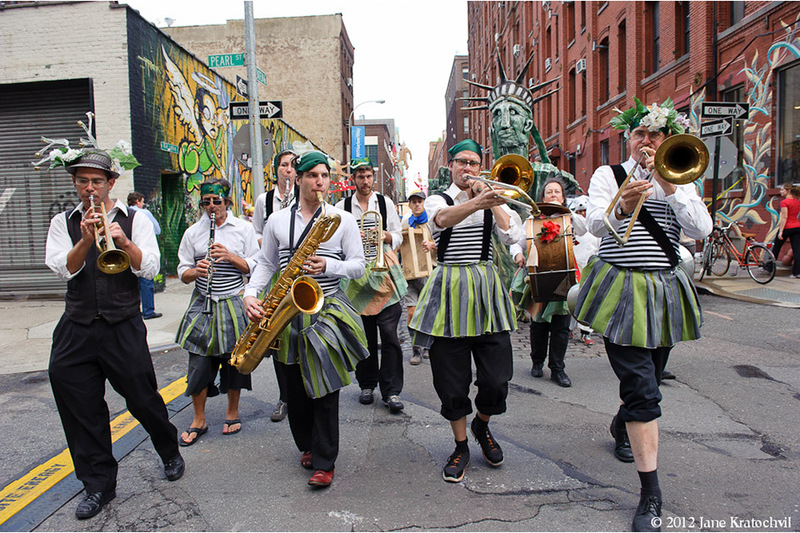 The 2012 festival pushed the boundaries of dance and movement. 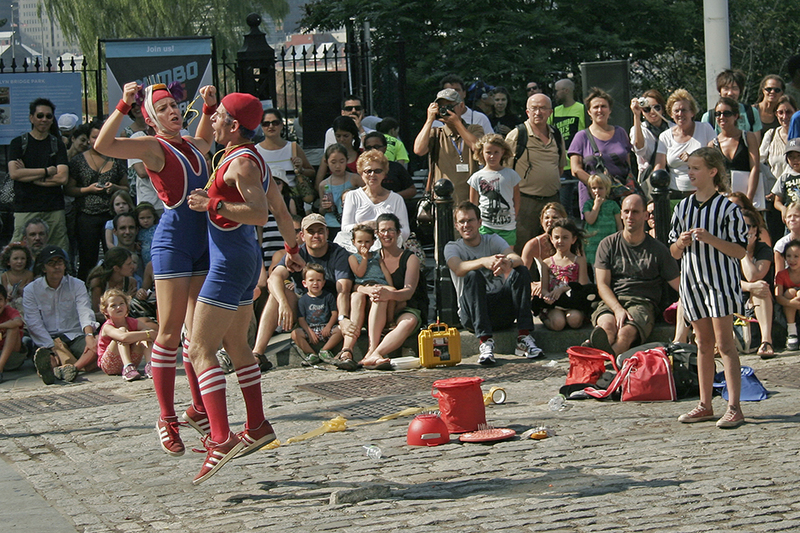 Flex is Kings LIVE introduced festivalgoers to the Brooklyn-born style of street dancing known as Flexing. 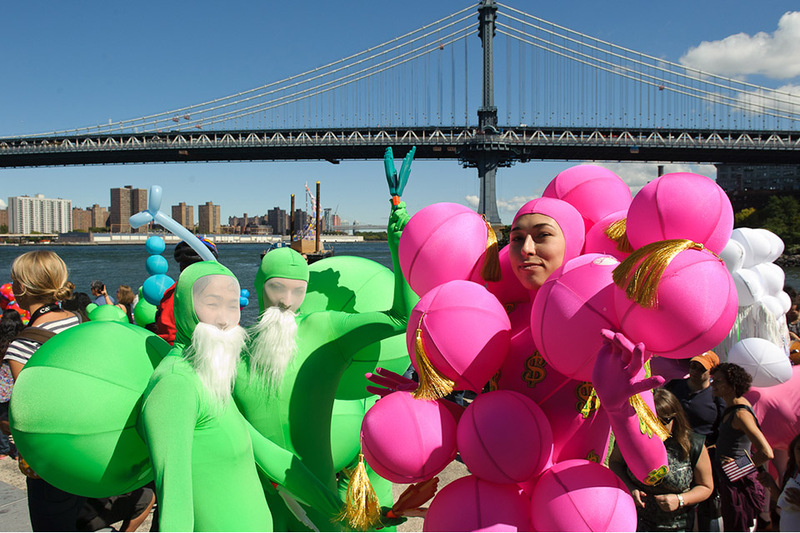 Eve Bailey choreographed dancers to climb and twist around sculptural pillars on the waterfront, and the audience embodied the movements of their superhero avatars in an interactive video project by Wildbytes. 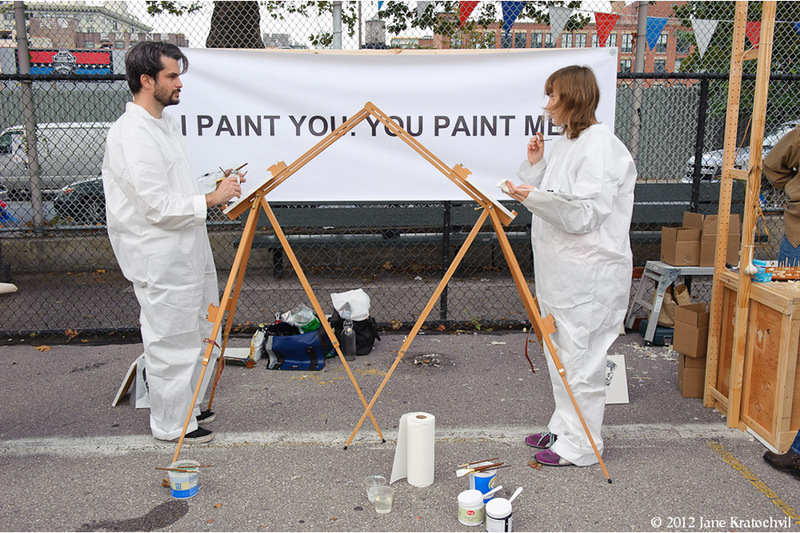 I Paint You. 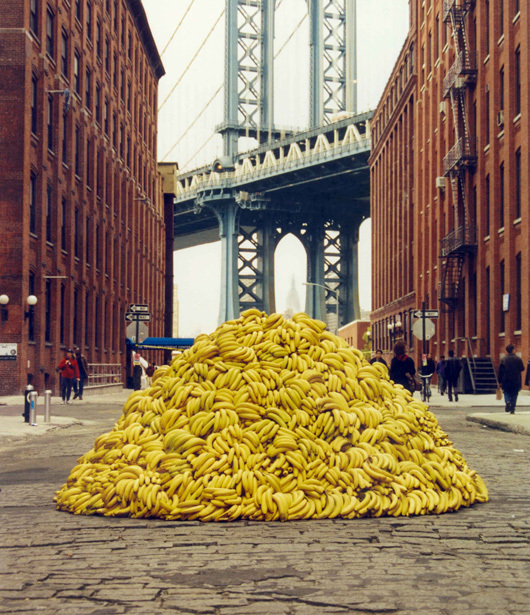 You Paint Me. 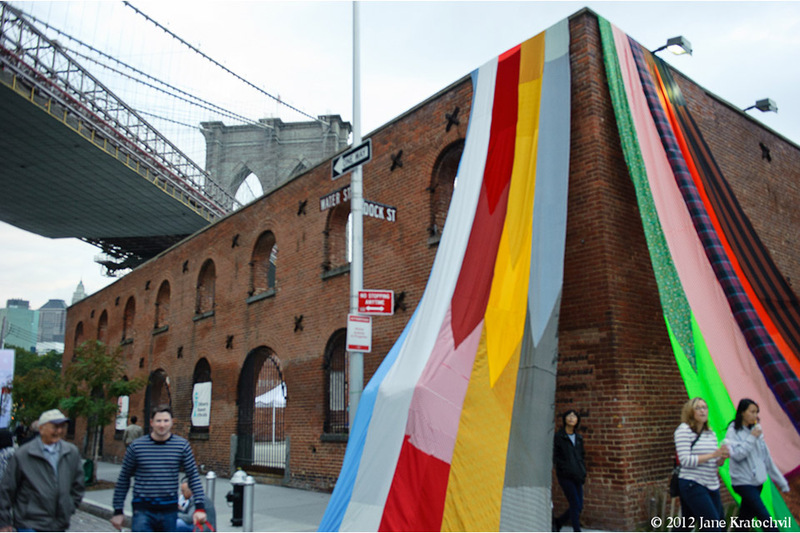 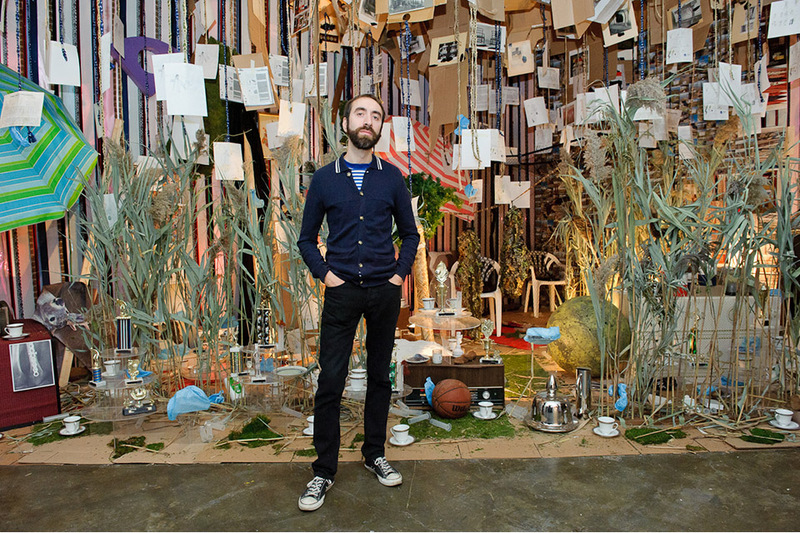 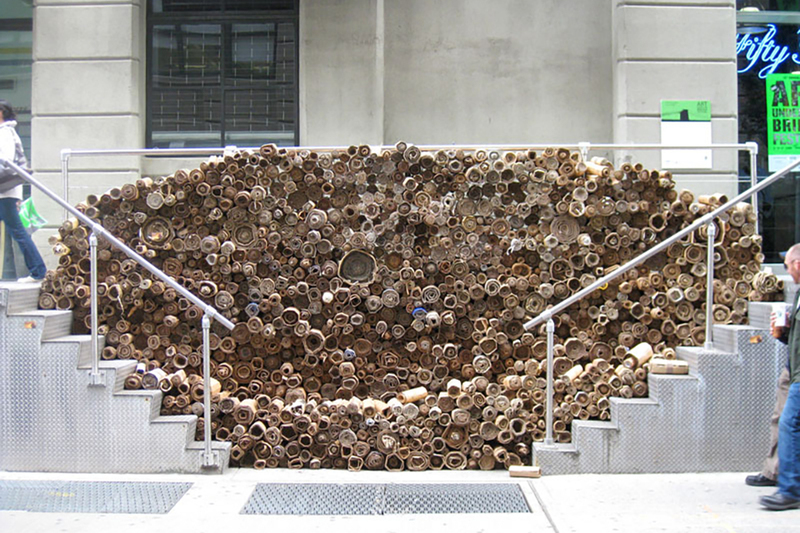 DUMBO’s waterfront setting held a deeper significance for artists in 2013 as many responded to the devastation and recovery in the aftermath of Hurricane Sandy. 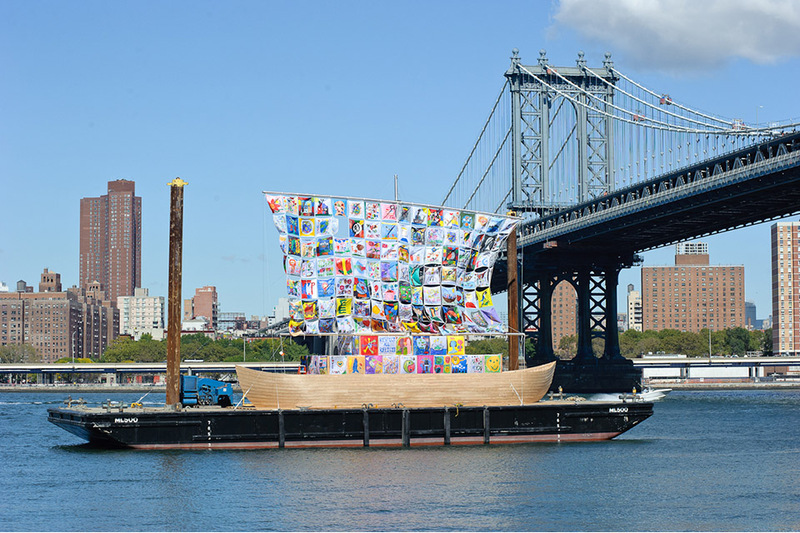 Ilya and Emilia Kabakov’s Ship of Tolerance brought a message of peace and unity through children’s drawings. 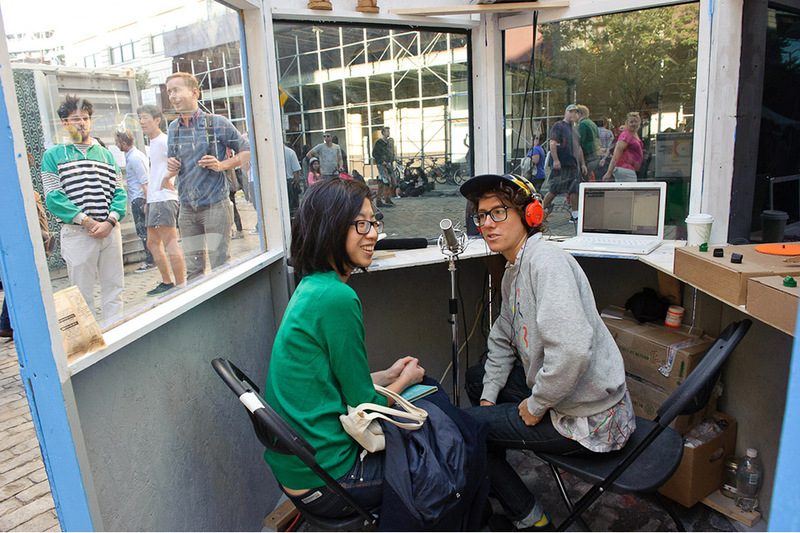 Lillian Gerson invited visitors to broadcast their personal Sandy stories with her project Radio Wave. 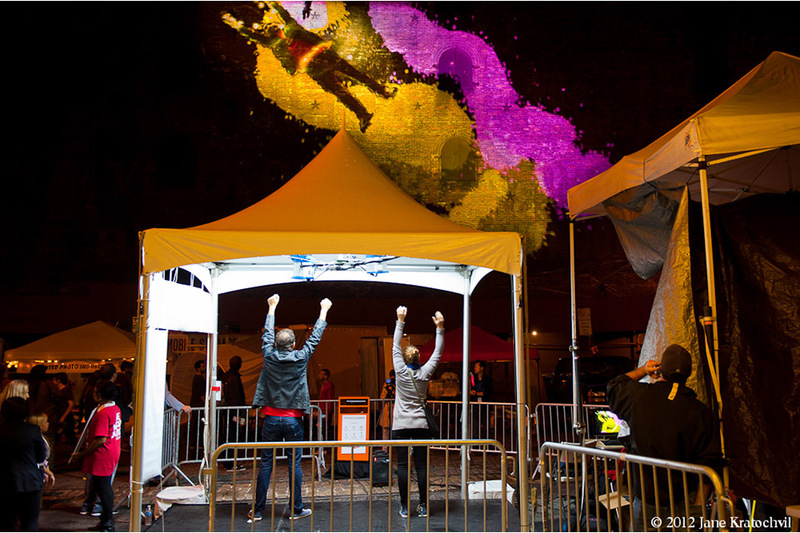 Public participation and activation saw its peak at the 2014 festival. 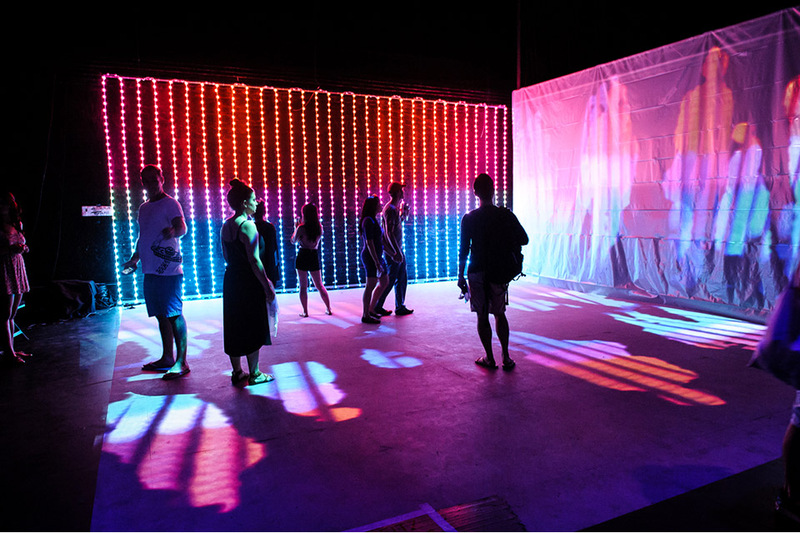 Audiences triggered lights and sounds, colors and text through various interactive technology. 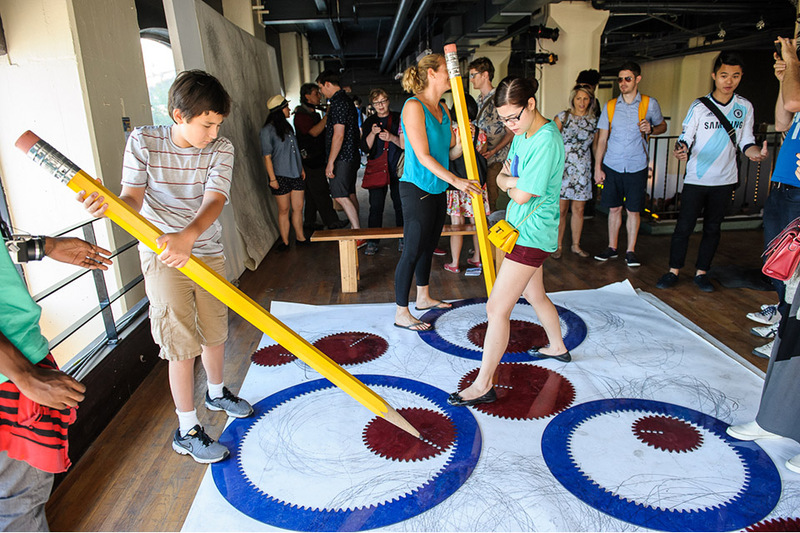 Analog participation was called for with a giant spirograph and a chalk wall that invited the public to state their hopes for the future. 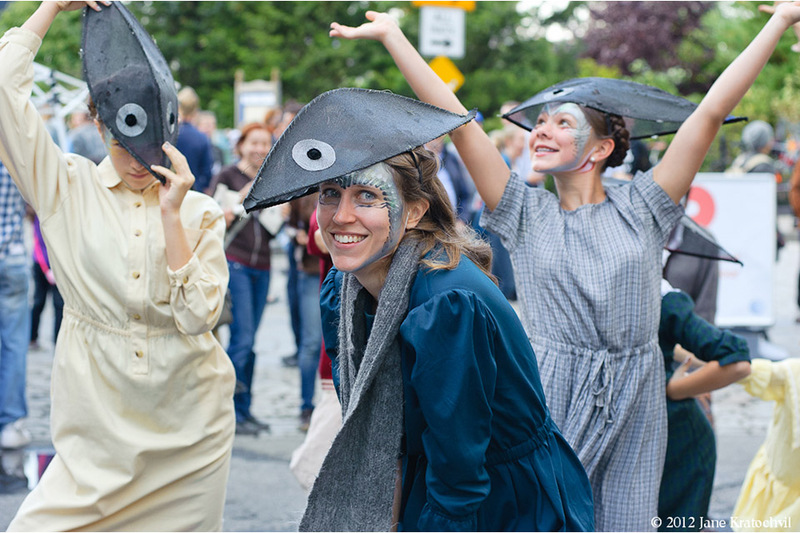 A festival favorite for four consecutive years, Heather Hart’s Bartertown created a village of commerce-free exchange. 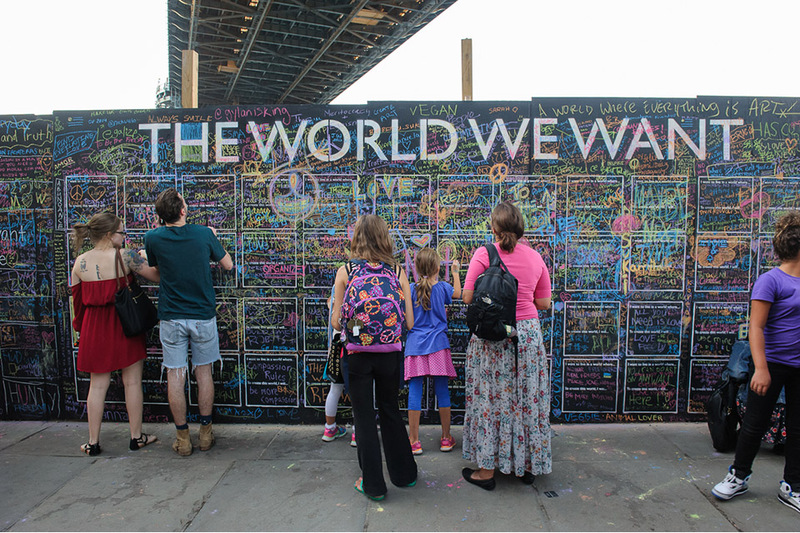 OUR THANKS EXTENDS TO THE THOUSANDS OF PEOPLE OVER THE YEARS WHO MADE THE FESTIVAL POSSIBLE. 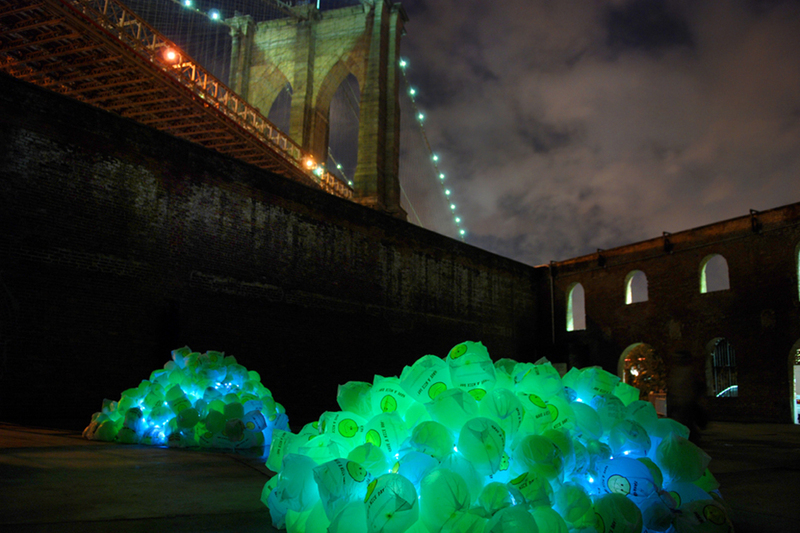 TO EVERY ARTIST WHOSE IDEAS ENLIVENED OUR LANDSCAPE AND CHALLENGED AND DELIGHTED US ALONG THE WAY. 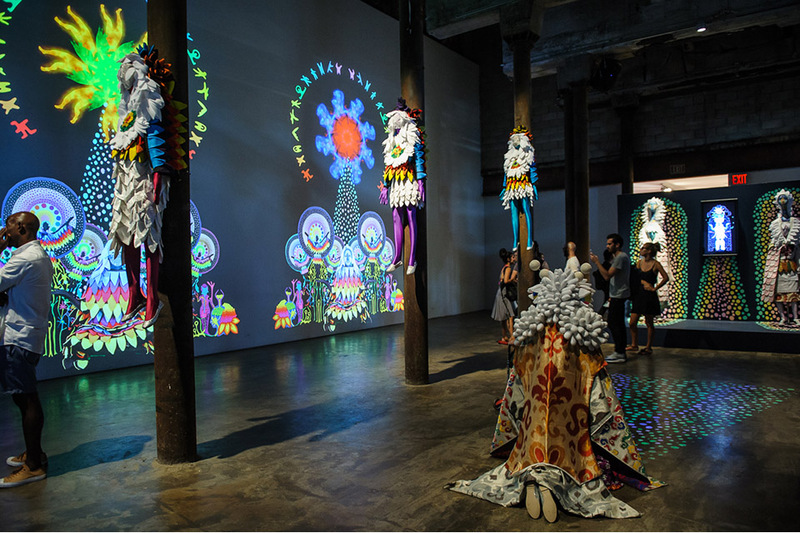 TO EVERY WILLING VENUE AND BUSINESS OWNER WHO WELCOMED ART INTO THEIR WORLD. 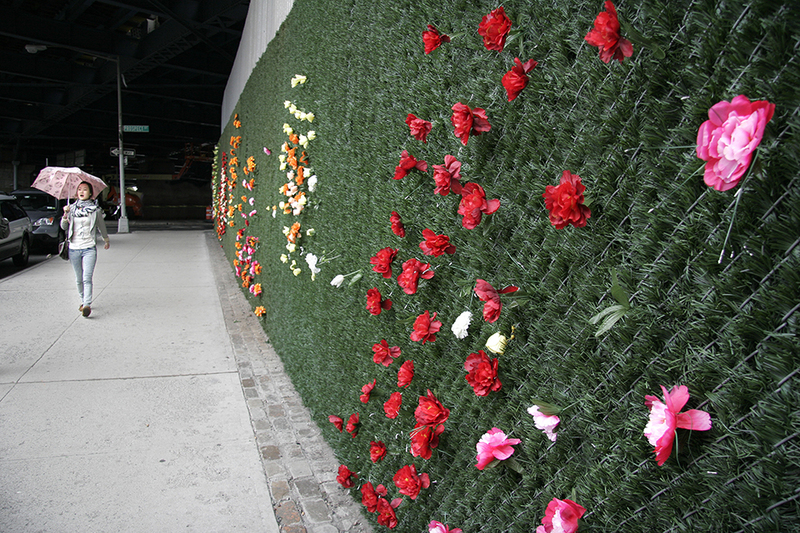 TO EVERY CITY OFFICIAL AND GOVERNMENT BODY THAT ALLOWED ACCESS AND PERMITS. 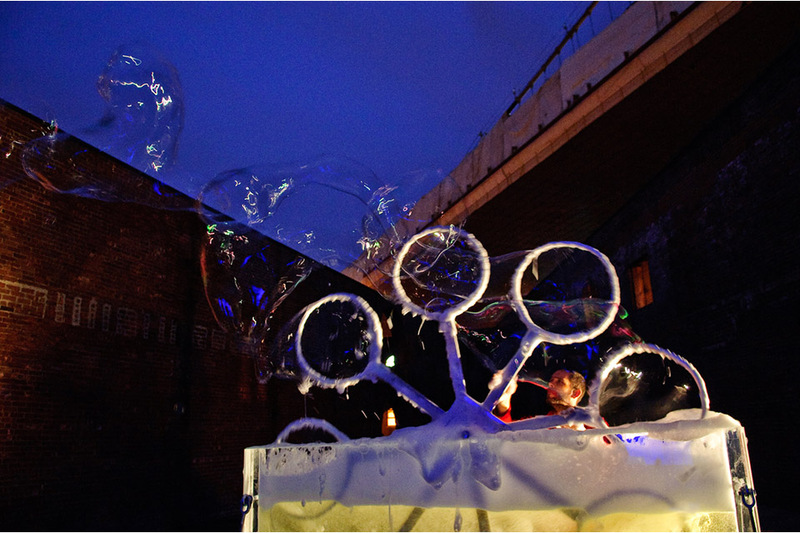 TO EVERY DONOR AND FUNDER WITHOUT WHOM WE WOULD NOT HAVE SEEN THE FESTIVAL’S GROWTH AND SUCCESS. 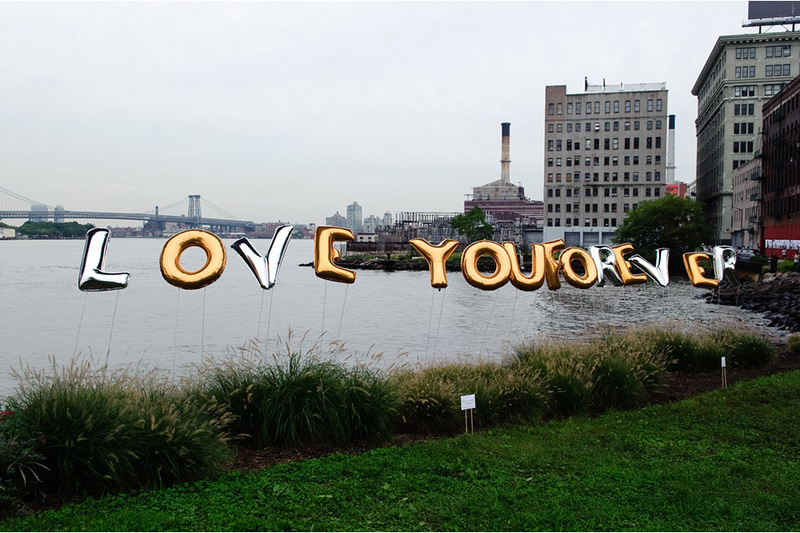 TO EVERY VENDOR AND SUPPLIER WHO MADE US LOOK OUR BEST ONLINE, ON BANNERS, AND IN PRINT. 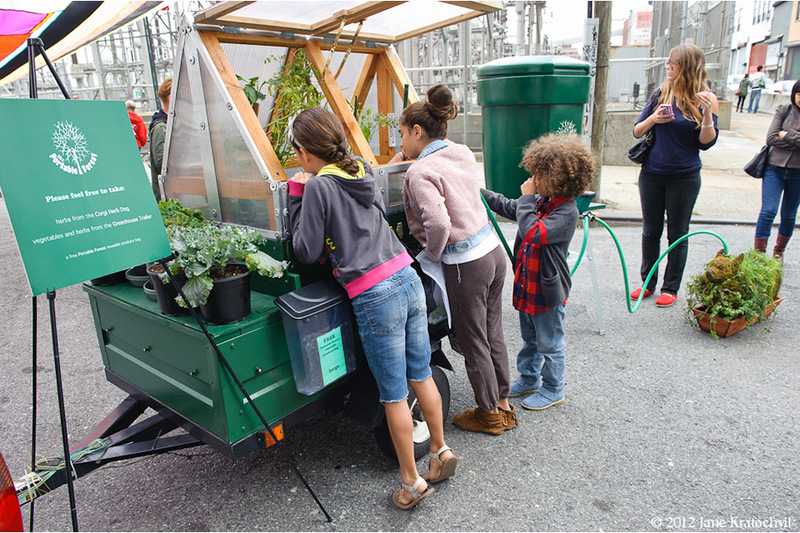 TO EVERY VOLUNTEER WHO SHOWED UP AND GAVE US TIME, ENERGY, SKILLS, AND SMILES. 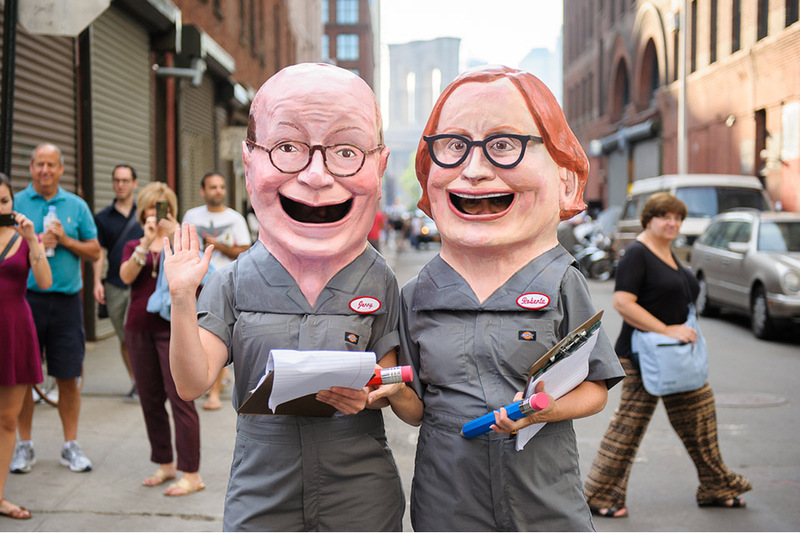 TO EVERY MEMBER OF THE PRODUCTION STAFF WITHOUT WHOM THE GIFTS AND LABOR OF ALL OF THE ABOVE COULD NOT HAVE BEEN MELDED TOGETHER INTO ONE BEAUTIFUL BREATHTAKING EVENT EACH AND EVERY YEAR.